In her report to the Trustees of Abbot Academy, 1915, Headmistress Bertha Bailey suggested a dignified entrance to the school grounds. It seemed appropriate to build this in memory of Martha Stockbridge Merrill, head of the French Department and a teacher at Abbot for nearly 30 years, 1878-1907. Miss Katherine Kelsey was a prime mover in the project. Requests were made to alumnae for funds and then, the project was stopped due to lack of materials and labor during World War I. The famous firm of McKim, Meade and White of New York drew the plan. The architect first in charge was William C. Richardson, who thirty years before did Abbot 's Draper Hall. He was ill during the progress of the Merrill Memorial Gateway, but insisted on directing the building from his sickbed. 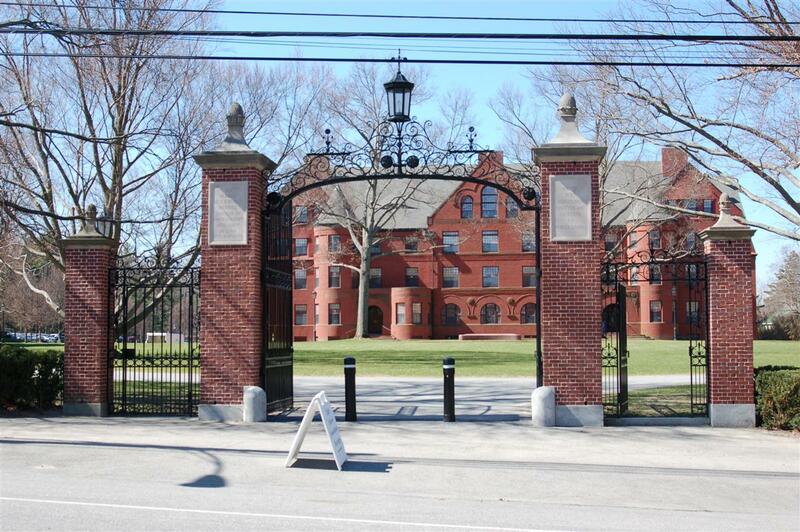 The dignified gate has a central entrance for cars with two smaller ones for pedestrians. The masonry of four tall pillars are of Harvard brick, trimmed with Bedford limestone. The iron grillwork with the arch above surmounted with a lantern was by Krasser Iron Works.